Eisenhower Tunnel is the highest vehicle tunnel in the world at an elevation of 11,155 feet. It is located roughly 60 miles from Denver. It has been named after President Dwight D. Eisenhower. It operates 24 hours a day and seven days a week. It employs 52 full time employees and their duties involve everything ranging from emergency response to tunnel washing etc. The monthly average expense of the electricity bill of the Eisenhower Tunnel is approximately $70,000. The total length of the Eisenhower Tunnel is 1.693 miles. This tunnel was originally called the Straight Creek Tunnel, named for the valley where the west portal is located. The Eisenhower Tunnel was opened in 1973 and the second tunnel, Johnson Tunnel was opened in 1979. The first tunnel named as the Eisenhower Memorial Bore took total five years to complete. Within five months of the opening, more than 1 million vehicles had passed through the tunnel. There is up to 1,496 feet of rock and earth above both the tunnels. The height of these tunnels is 13 feet 11 inches. Approximately 190,000 cubic yards of concrete was used for the lining of each tunnel. These tunnels have a travel width of 26 feet in each direction, consisting of two 13 foot lanes. On an average, these tunnels carry approximately 30,000 cars per day and in the month of July, the number reaches 40,000. Declan, Tobin. " 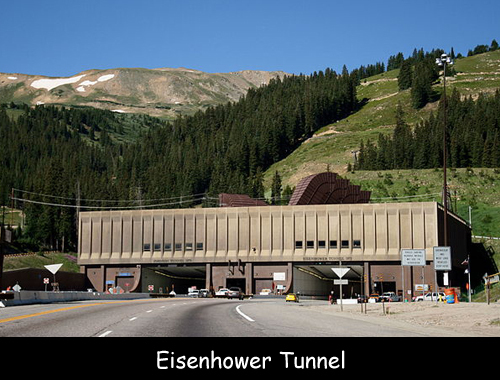 Eisenhower Tunnel Facts for Kids ." Easy Science for Kids, Apr 2019. Web. 26 Apr 2019. < https://easyscienceforkids.com/eisenhower-tunnel/ >.